When To breed Heifers Size- #1 consideration when breeding yearling heifers. Size- #1 consideration when breeding yearling heifers. Heifers should weigh. 2 When To breed Heifers Size- #1 consideration when breeding yearling heifers. 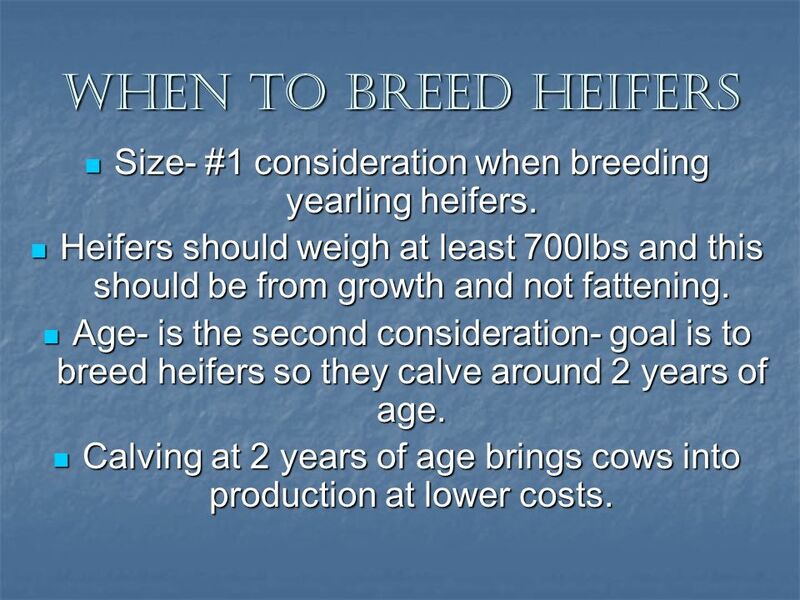 Size- #1 consideration when breeding yearling heifers. Heifers should weigh at least 700lbs and this should be from growth and not fattening. Heifers should weigh at least 700lbs and this should be from growth and not fattening. Age- is the second consideration- goal is to breed heifers so they calve around 2 years of age. Age- is the second consideration- goal is to breed heifers so they calve around 2 years of age. Calving at 2 years of age brings cows into production at lower costs. Calving at 2 years of age brings cows into production at lower costs. 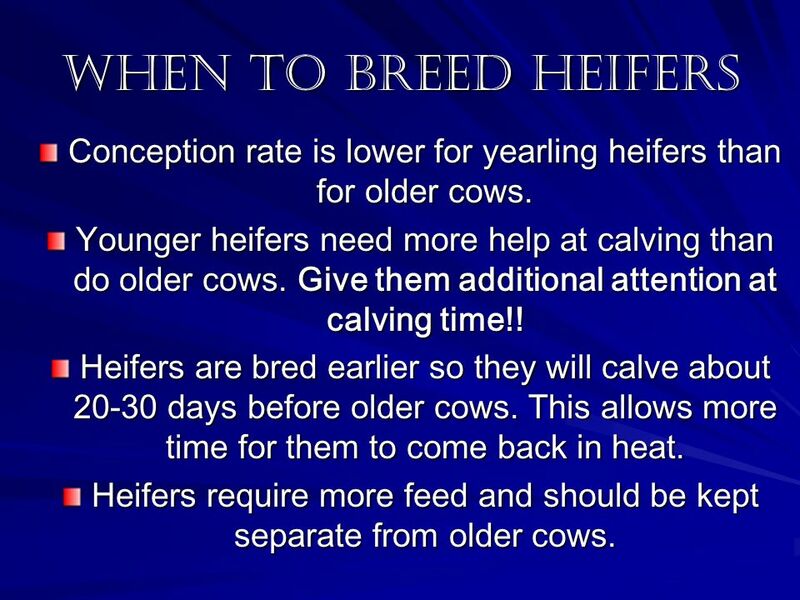 3 When To breed Heifers Conception rate is lower for yearling heifers than for older cows. Younger heifers need more help at calving than do older cows. Give them additional attention at calving time!! Heifers are bred earlier so they will calve about 20-30 days before older cows. This allows more time for them to come back in heat. Heifers require more feed and should be kept separate from older cows. 4 calving Easier to manage the herd when a shorter calving season is maintained Easier to manage the herd when a shorter calving season is maintained Spring calving requires less housing, less feeding during the winter, and less labor. 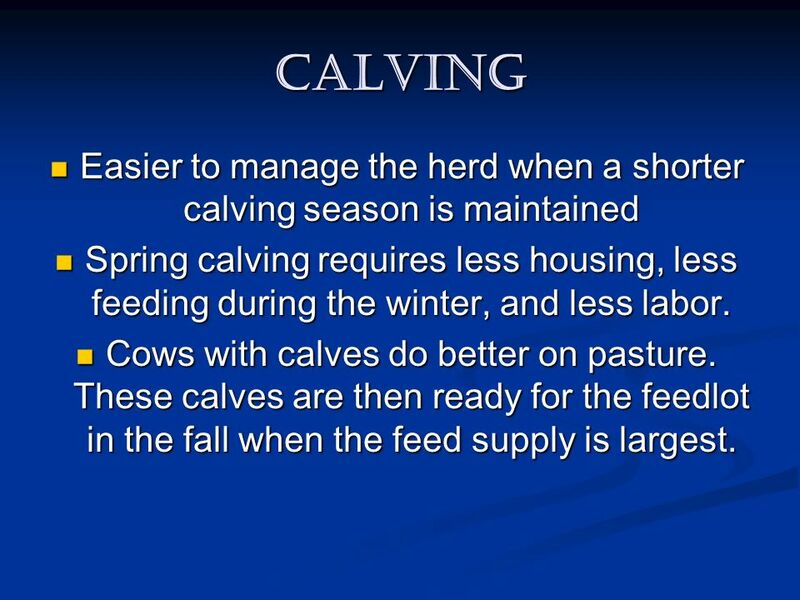 Spring calving requires less housing, less feeding during the winter, and less labor. Cows with calves do better on pasture. These calves are then ready for the feedlot in the fall when the feed supply is largest. Cows with calves do better on pasture. These calves are then ready for the feedlot in the fall when the feed supply is largest. 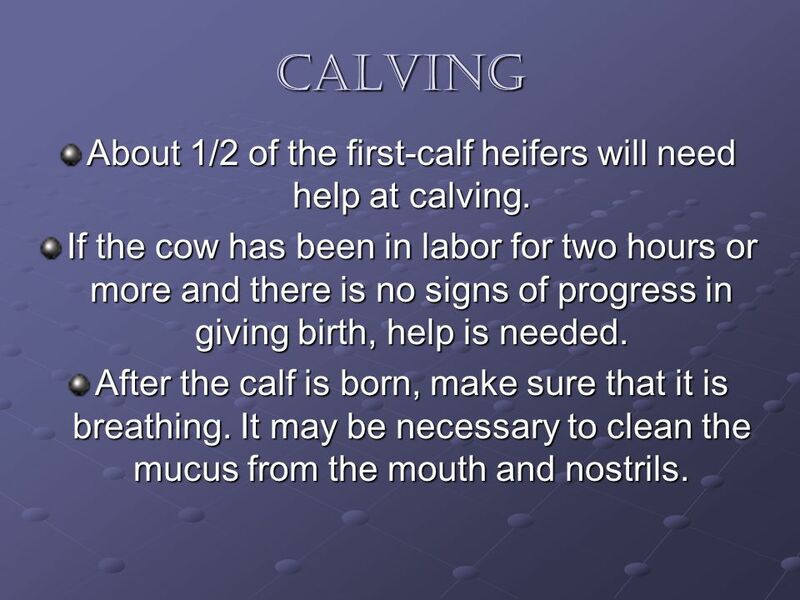 5 calving About 1/2 of the first-calf heifers will need help at calving. If the cow has been in labor for two hours or more and there is no signs of progress in giving birth, help is needed. After the calf is born, make sure that it is breathing. It may be necessary to clean the mucus from the mouth and nostrils. 6 calving In cold weather, the calf must be kept warm and dry until it is on its feet. In cold weather, the calf must be kept warm and dry until it is on its feet. 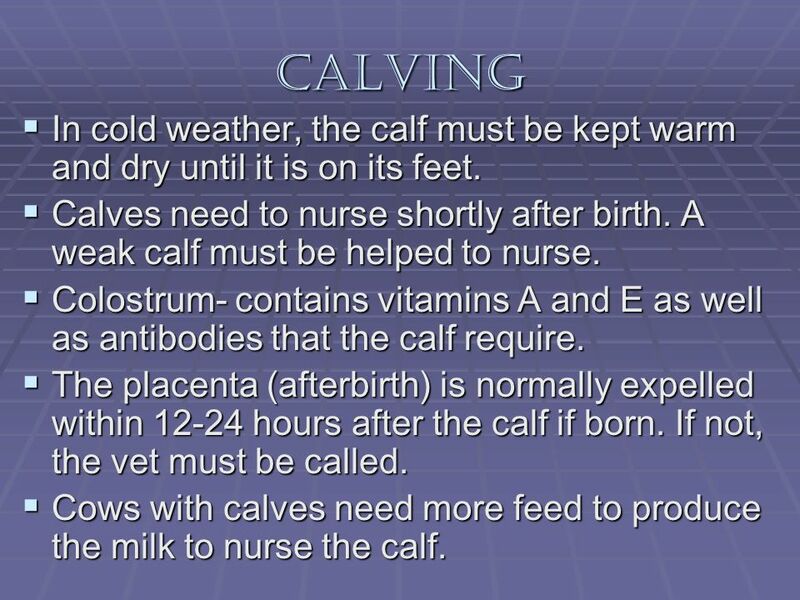 Calves need to nurse shortly after birth. A weak calf must be helped to nurse. Calves need to nurse shortly after birth. A weak calf must be helped to nurse. Colostrum- contains vitamins A and E as well as antibodies that the calf require. Colostrum- contains vitamins A and E as well as antibodies that the calf require. The placenta (afterbirth) is normally expelled within 12-24 hours after the calf if born. If not, the vet must be called. The placenta (afterbirth) is normally expelled within 12-24 hours after the calf if born. If not, the vet must be called. Cows with calves need more feed to produce the milk to nurse the calf. Cows with calves need more feed to produce the milk to nurse the calf. Download ppt "When To breed Heifers Size- #1 consideration when breeding yearling heifers. Size- #1 consideration when breeding yearling heifers. Heifers should weigh." Sheep Production Chapter #9. Why choose sheep? n Sheep can survive where cows cant n Sheep will eat problem weeds like Leafy Spurge n Profit per acre. Sheep Management Introduction to Agriculture March 1999. COST OF DEVELOPING BRED HEIFERS DR. CURT LACY EXTENSION ECONOMIST-LIVESTOCK. Oklahoma Beef Council What cattle do for our lives and world. Yearling heifer mating Rebecca Hickson. Profitability of calving heifers Beef cow efficiency Why calve heifers Why not calve heifers Performance of heifers. Animal Reproduction Animal Science II Unit 10. Objectives Identify and describe the male and female reproductive organs Describe the function of the endocrine. Annual Livestock Production Cycle (ALPC) Module 6. New Zealand’s specialist land-based university The New Zealand Dairy Industry. Dam/Offspring Interaction. What type of relationship is it? –Care giving and care seeking Giving on the part of the mother, known as “Maternal” Care seeking. Southwest Research Center Pasture-Based Seasonal Dairy Joint effort of MU, allied industries and commercial producers. Dairy Science An Introduction. Types of Dairy Cattle Operations Intensive Dairy Production- animals are raised in a more confined setting such as an open. Level II Agricultural Business Operations.  Understand the reproduction cycle  Assess herd reproductive efficiency  Understand the decisions involved. Parturition. What is it? –The process of giving birth.